100-hour Certificate programme. For Personal Development or for those who want to prepare for professional qualification. Taught & designed to Level 4 on the NFQ. This comprehensive and rewarding course offers you both a stimulating learning experience and an enjoyable introduction to the world of counselling and psychotherapy. The four distinct course modules follow a natural progression from personal development and theoretical approaches to the skills practice and an overview of counselling and psychotherapy as a profession. You can expect a mix of traditional classroom-style and more hands-on experiential learning, with the opportunity to forge real and often lasting connections with your colleagues. Our classes typically include students from a wide range of ages and backgrounds, offering opportunities for rich interpersonal sharing and learning. Indeed, in keeping with the ethos of counselling and psychotherapy, each student’s individual story is respected, and their unique talents encouraged throughout the course. This course is for those who wish to learn more about both the inner workings of counselling and psychotherapy and themselves as individuals. It will also appeal to those who intend to pursue a career in the field and become an IACP accredited professional or who wish to incorporate counselling knowledge and skills into their current personal/ professional lives. The course aims to be both intellectually stimulating and useful. The skills and knowledge acquired may be effectively applied to any number of ‘real life’ situations and professions. These skills may include increased self-awareness and empathy, improved communication and listening abilities, and a range of counselling tools that can enhance interpersonal relationships. Students wishing to pursue a career in the field will also be provided with the essential foundational elements needed as part of enrolment for a further qualification, such as our BSc Honours Degree in Counselling and Psychotherapy. 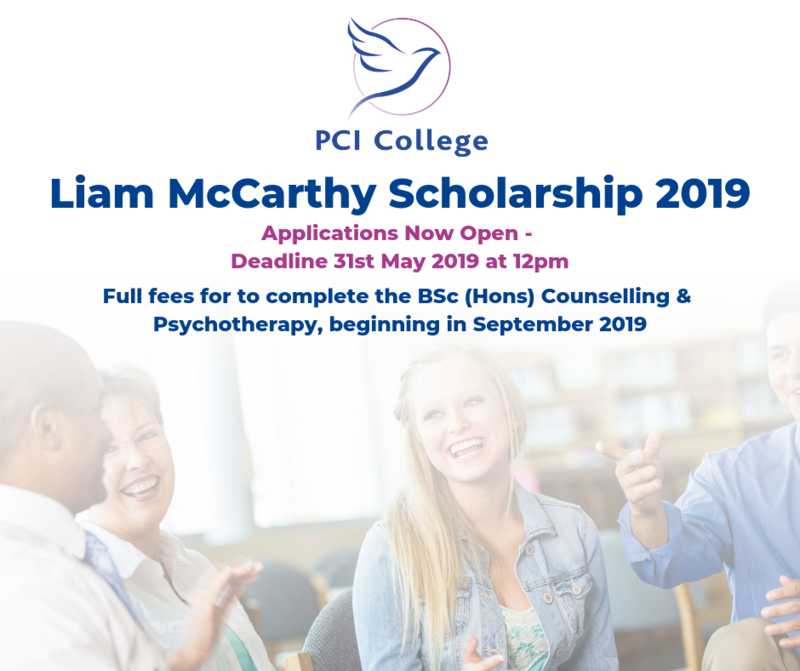 Click image to learn more about the Liam McCarthy Scholarship 2019! Accreditation: Upon completion of this course, students will be invited to apply to our Middlesex University BSc (Hons) in Counselling & Psychotherapy (Level 6) which fully meets the training criteria of the BACP & IACP. Eligibility: Applicants should feel that they possess a maturity to reflect on their own development as a person. Assessment: Assignments - Taught and Designed to Level 4 on the NFQ. Please note that timetables are provisional and may be subject to change. Places on the Certificate course are limited to 20 in each venue, so we would encourage you to book your place as soon as possible. Booking: To book your place, download the Application Form on the left of this page, fill it out and return to us with your deposit. If posting, please send to Corrig House, Old Naas Road, Clondalkin, Dublin 22. If emailing, please send it to studentservices@pcicollege.ie. In the meantime, call us at 01-4642268 or email info@pcicollege.co.uk for more information. We also have a Blended Learning Certificate available for those who would like to study at their own pace from home. Develop an understanding and appreciation of counselling as a distinct interpersonal form. Learn and practice key frameworks for counselling and the skills required to implement them. 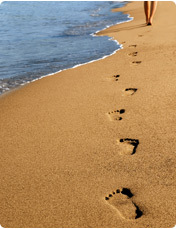 Reflect on personal growth and experience of life as a primary source of your understanding of counselling. Become familiar with some of the main issues presented in counselling and an outline of how each is treated. "Having graduated and started practicing and meeting fellow counsellors, I have become more impressed with the breadth of the training that we received with PCI...Overall I had an excellent experience with PCI and would gladly recommend the college to anyone thinking of training in the area"
Applicants are invited to complete and return the online Application Form. Applications must be accompanied by an Initial Deposit of £250, which is deductible from course fees if the application is successful. Please note that the name used on your application needs to be the same name that you have on your passport. The balance of the fees £700 is payable in full before the course commences. Applicants are entitled to a refund if they decide to cancel within 14 days of receipt of their application. The College makes every effort to avoid altering course times, course commencement and conclusion dates. However, should any changes be necessary, you will be notified at the earliest opportunity. All courses run subject to demand and the formation of a viable class cohort. A full refund will be given to all applicants in the event that a class does not proceed. All PCI College Lecturers are highly qualified, experienced individuals who hold a minimum of a Diploma in Counselling & Psychotherapy and are practising Counsellors accredited with the BACP or IACP. Many hold MSc.s in specialist fields. Since our foundation we have taken the steps necessary to ensure the delivery of a quality service in an environment that is characterised by an attitude to adult learners that is supportive and encouraging. We aim to provide an experience of learning that will develop in students a hunger for reflective and critical analysis. Our learning programmes are designed to be participative, experiential and to draw whenever possible on prior lived experience. The academic value of programmes is enhanced by a learning environment that is warm, transparent, and genuine. Learners and staff interact in a mutual effort to engage in and promote the concept of lifelong learning. Upon completion of the Certificate Course, students will be invited to apply to our Middlesex University BSc (Hons) in Counselling & Psychotherapy (Level 6) which fully meets the training criteria of the BACP & IACP. Can I go straight into the Degree programme? The Certificate Course or Equivalent (see below) is a prerequisite for our Degree in Counselling & Psychotherapy….. Entry onto the Diploma & BSc (Hons) in Counselling and Psychotherapy may require catch-up work to be completed. This is based on assessment of your prior learning, which will be discussed at Interview. Moreover, for those considering a career in counselling, a FCertificate Course is an essential stepping stone to prepare for a professional qualification. It will help you develop an understanding and appreciation of counselling as a distinct interpersonal form and will help you decide whether it is the right career choice for you. Can I automatically do the Degree programme after completing a Certificate course? Upon completion of this course, students will be invited to interview for our Middlesex University Dip/BSc (Hons) in Counselling & Psychotherapy (Level 8) which fully meets the training criteria of the IACP. Entry is by application and interview. What is the difference between the various start dates of the Certificate Course? All of our Foundation courses are 100 hours and are exactly the same content. Can I do the Certificate course as a standalone course? Of course, the Certificate in Counselling & Psychotherapy is an enjoyable and challenging course developed for those who want to enrich their own personal development. There are two written assignments – a book review and a reflection of your journaling throughout the course. How many are in a class? We keep classes small (20 students), we aim to provide students with experiences and opportunities which will enable them to develop their potential in a supportive, stimulating and challenging environment, where ideas are discussed freely and where there is a sense of sharing in a continuing process of self-discovery. I am on Social Welfare. Is there any funding available? As we are a private college, there is no specific funding available. However, people do receive funding due to their own personal circumstances. Contact your local Citizens Information Office for more information. What job opportunities are there for counsellors/psychotherapists? The field of counselling & psychotherapy is very broad. Some graduates are working part-time in private practice, some are working full time in eg HSE or schools or addiction centres or charities etc, and some have pursued their own area of interest by providing a new service in their community. From surveys of graduates, most are working at least part-time in counselling & psychotherapy but some are simply continuing with their original career e.g. teachers, Garda Síochána etc. What’s the deadline for Certificate course applications? There is no deadline. The course is filled on a first come, first served basis. PCI College is delighted to announce that its in-class Certificate in Counselling & Psychotherapy has become the first foundation course of its kind in the Republic of Ireland to receive ‘Quality Checked Training’ status from the National Counselling Society (NCS). This means that the NCS, who are based in the UK, have extensively reviewed and approved the course's content and delivery, deeming it to be worthy of their high standards. This comes after lengthy collaboration between Programme Leader Simon Forsyth and the NCS and reflects the course's excellence. The National Counselling Society was established in 1999 and plays an important role within the profession of counselling in the UK. 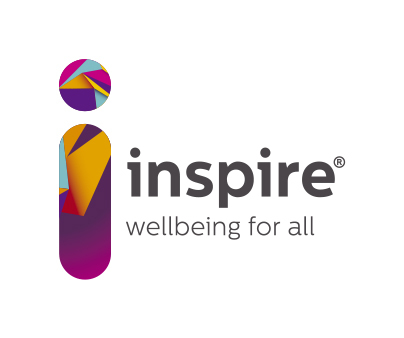 Their ethos is that counselling is a unique vocation and that this should be reflected in all related policies. They act to protect counselling from inappropriate regulation if they feel it could harm the work of counsellors and the diversity, creativity and range of training options that currently exist within the profession. For more information, please visit the Society's website here. We also offer a Blended Learning Certificate in Counselling & Psychotherapy course for those who would like to study at their own pace from home.